The RP Photonics website is immensely popular – probably more than any other website in the area of laser technology. On this page, you can find out details on our traffic. This is relevant for those who are interested in advertising on our site. While many others tend to hide their data, or display them in unclear form (e.g., to what pages exactly do they apply? ), we show our data proudly and clearly. Has any photonics company or publisher got a Google ranking for laser technology which can compete with ours? We don't know a single one! The ranking of our website on Google search results pages for laser technology is enormously high, probably surpassing the ranking of any other website worldwide. Our page on search engine rankings tells you how you can easily verify that statement and what is behind this amazing success. This describes the technical consulting business. This describes the simulation and design software offered by RP Photonics. The famous RP Photonics Encyclopedia (started in 2004) with 764 high-quality articles is the core magnet. It attracts huge amounts of traffic, part of which spills over into the other parts, particularly to the buyer's guide (see below). We consider our blog, the Photonics Spotlight, also as part of the encyclopedia. The RP Photonics Buyer's Guide has far over 2000 pages – mostly pages listing suppliers for all sorts of photonics products and company profiles. In March 2019, the encyclopedia obtained 194,356 page views. In March 2019, the buyer's guide had 19,837 page views, and the buyer's guide caused 10,401 referrals to websites of suppliers (even though most suppliers have only free entries!). We had 237,461 page views (= page impressions). So many times, a page of our website has been displayed in the browser of some user. There have been 118,800 referrals from Google to our website. Users aren't searching for products every day, but when that time comes, they remember where to go. Note that typical visitors are seeking for technical information on most days, and look up suppliers only on some days. Therefore, they naturally cause more traffic on the encyclopedia than in the buyer's guide. However, as regular users of the encyclopedia, many will remember where to find the suppliers when these are needed. Also, there are kinds of enhanced entries which even allow displays on the pages of encyclopedia articles. Total: 2,264,339 page views (2,055,115 + 209,224) within 12 months. Geographical distribution in 2019-03: Africa 1.5%, America 32.0%, Asia 27.2%, Australia 1.7%, Europe 37.7%. 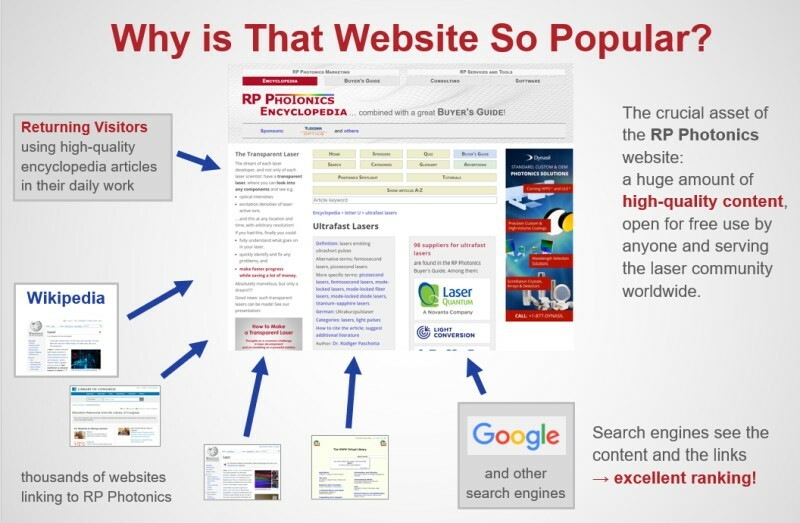 The RP Photonics website is probably the most popular photonics website worldwide. We are aware of only a single website in the area of photonics which claims more traffic than us (photonics.com); we are clearly ahead of well-known sites like Laser Focus World and optics.org. Note that such sites typically contain thousands of articles which appeared in the publisher's trade journal(s) in recent years. Those articles may attract some traffic through Internet search engines, but are of little relevance for the buyer's guide on the same site. On our site, the main traffic is generated by our famous photonics encyclopedia, and that is strongly supporting our buyer's guide: all articles which are related to photonics products are linked to the corresponding pages with supplier listings in the buyer's guide, and vice versa. Check your server statistics for the referrer domains, and you will (if you have at least a free entry on our site) probably find the same as others: that you get by far more traffic from our site than from any other one – especially if you have an ad package in the RP Photonics Buyer's Guide. As we do not require our users to register with us, we have no detailed knowledge on them. (We also highly value data privacy.) However, it is perfectly clear that basically all users are experts working in the area of photonics – in industry or in scientific research. Due to the very technical nature of our website and its devotion to the area of photonics only, nobody else would spend time there. Would you like to learn on our user surveys? This confirmed our expectation that the vast majority of readers are professionals in the field of photonics, working either in scientific research or in the industry. This shows that our buyer's guide obtains traffic not primarily from marketing people who simply want to check their own entries, but from those user groups which are most likely to buy photonics items. Geographically, users are spread worldwide. Due to the use of the English language, the resource is accessible for a large proportion of the worldwide population, particularly for technical experts. Obtaining reliable web traffic data is not a trivial thing; we do that in a very careful way, which leads to tentatively lower traffic numbers and respects the privacy of the users. If you like to learn how we do it, then click here. If a single machine (more precisely, a single IP combined with a user agent) is doing more than 200 page views on one day, that whole traffic is discarded, as it might be some robot activity. Additional filtering occurs when a machine often causes many page requests with a rather short temporal delay. If a user loads the same page which he or she has just loaded before, only a single view is counted. Views from any computers within RP Photonics are also discarded. Note that we operate strictly in accordance with the strict German data protection laws. In particular, we do not record the users' IP addresses, but only store encrypted data, from which the IP values cannot be reconstructed (at least not without excessive computation power). If we used Google Analytics instead of our own software, we would presumably obtain significantly higher traffic numbers, as Google Analytics would not filter out false hits (e.g., multiple hits to the same page) similarly strictly. We do not use Google Analytics due to concerns about privacy matters and related legal uncertainties. The previously used AWStats software also reported substantially higher numbers than our new system. We conclude that our system provides a fairly conservative estimate of the web traffic.